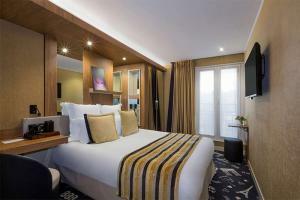 The Best Western Hotel le 18 Paris offers a casual, inviting atmosphere and modern amenities in Paris' 18th district. 49 spacious rooms celebrate the joyful style and authenticity of Paris, and offer conveniences such as flat-screen satellite TVs, coffee/tea makers, free Wi-Fi and mini-bars. Several rooms afford magnificent views of Montmartre and the Sacre Coeur. The front desk is open 24-hours, and are available for any questions or needs that may arise during your stay. Each morning there is a breakfast buffet served for guests to jump start your day, and a bar to enjoy a cocktail after a your day of exploration. Located in Paris' 18th arriondissement. Charles de Gaulle airport is about 14 miles away; Orly Airport is about 17 miles from the hotel. The nearest metro station is Porte de Clignancourt, less than a five minute walk from the hotel.